Actually, it’s understandable. The guy is friendly, but quite shy and modest. He’s very polite, so would never pry. He minds his own business and is reluctant to burden people with idle talk. Add to this seven years in his quarters squeezing words out of his head to write a book, a book which required that he often be out hiking or kayaking in the wilderness on book-related research. This guy was seldom seen scoping the village bulletin boards or schmoozing at local cafes. Not that he’ll suddenly become Mr. Man About Town now that the book is published, for David Pitt-Brooke is a naturally reserved man. How the book came to be published is in itself an interesting tale. The editors at Raincoast publishing read the manuscript, didn’t reject it, but put in the big slush pile of manuscripts with potential to be considered— someday, maybe. There it remained in the dark until a new editor happened to draw the attention of a colleague to an impressive article in Canadian Geographic that David had written about a colony of falcons on remote Langara Island in the Queen Charlottes. The colleague remembered that there was a manuscript by this fellow Pitt-Brooke in the slush pile, and the rest, as they say, is history. A footnote to this anecdote is that the article in Canadian Geographic earned David a national award for science journalism. Everyone was sure David would have a career in the sciences, not the arts. His schooling was in natural history, and he got a degree in veterinary medicine as a route into wildlife research and management. He says he never actually thought or planned in terms of a career. “My main motive was to live in beautiful, out-of-the-way places.” He was working for National Parks doing public education when the concept of Chasing Clayoqot occurred to him. Today, David still dreams of out-of-the-way places. “An ideal life”, he says, “would consist of being a comfortably well-off nomad able to travel and live in each environment at its most characteristic time—the time when it delivered its ecological payload.” This man does not lust after luxuries or trendy anything. But I can imagine his excitement if he were to, let’s say, be present and surrounded by ten thousand flamingos touching down on their annual migratory route. I ask David to name some things which are highlights for him. He leads off with the thrill of receiving the science journalism award. He loves the annual lantern festival held at Tofino Botanical Gardens. Camping in the Chilcotin is big. And the Vancouver Folk Fest. “I love the music, and I love hanging out with Tofino friends on the big tarp.” David in fact, is one of the runners that race with the tarp when the gates open to claim a space as close and center to the main stage as possible. He calls this yearly race the “Birkenstock 500”. But we are lucky, I think, that David did what he did to give the world Chasing Clayoquot, a very special book of experiences and insights. Shirley Langer has resided in Tofino since 1995. She describes herself as a woman about town with a well developed civic conscienceness. 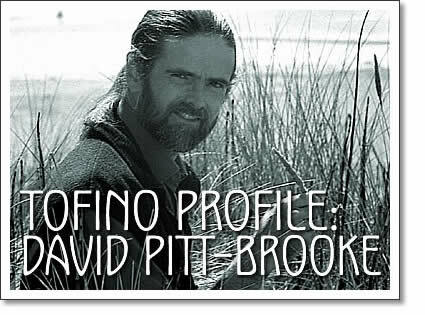 Tofino profile of local author David Pitt-Brooke, written by Tofino writer Shirley Langer for Tofino Time magazine.